Improving signage can be a relatively simple and inexpensive strategy to enhance pedestrian and bicyclist safety. Especially at mid-block crosswalks or high-volume streets, signage that warns drivers of school-aged pedestrians can increase driver awareness and compliance with safety regulations. School zone signage is used within 500 feet of a school boundary or along a designated walking route to school. Signs are regulated by the Manual on Uniform Traffic Control Devices (MUTCD), which is created by the Federal Highway Administration (FHWA). New York State Department of Transportation (NYSDOT) has its own manual (NYSMUTCD), which is a supplement to the federal one. Currently, New York State has a 2010 supplement to the 2009 version of the FHWA MUTCD. The Assembly A sign is used to indicate to motorists that they have entered a school zone, generally defined as 500 feet or less from a school boundary. Two other street signs are used to indicate an uncontrolled pedestrian crossing within a school zone. 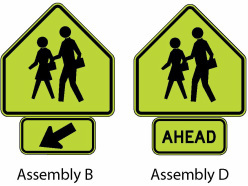 The Assembly B sign is placed right at the crosswalk, and the Assembly D sign is placed in advance to provide warning to motorists to expect children in a crosswalk. A special set of street signs can only be used around schools. The “Assembly C” sign indicates a reduced speed limit within the school zone. While school zone speed limits are typically 25 mph, Assembly Bill 321 (2008) allows cities to reduce school zone speeds to 15 mph. Over 95% of pedestrians survive when struck by a car traveling less than 20 mph. At 40 mph, only 15% of struck pedestrians survive. Street markings are another tool to appropriately warn drivers of the presence of school children. Usually stencils consist of markings like “SLOW SCHOOL XING” at least 100 feet in advance of an uncontrolled school crosswalk. Most street markings are done in white paint, but the use of yellow paint for street markings is allowed within school zones. A bicycle wayfinding system consists of comprehensive signing and/or pavement markings to guide bicyclists to their destinations along preferred bicycle routes. There are three general types of wayfinding signs: Confirmation Signs, Turn Signs, and Decision Signs. Colors may be painted on the curb to designate which behaviors are legal for motorists. Red zones indicate areas where it is illegal and unsafe to park. White zones designate passenger loading zones. Green zones indicate temporary parking zones. Ensuring that the appropriate curb color is painted at your school can help motorists behave safely around children. Curb color does require regular maintenance.